This brand new mountain home has been designed as a place that embraces the surroundings with all modern commodities at the same time that allows the guests to enjoy nature, bird-watching, mountain springs and creeks submerged in the lush vegetation and privacy. There are 2 bedrooms with full size beds and the master bedroom with queen size bed. 2 full bathrooms, open kitchen area with all basic appliances, internet and satellite tv also available. Bird watching trail behind the property as well though more than 40 bird species can be spotted right from the front porch. The town is only 12 minutes away and several tourists attractions are in the town and in the next town up the mountain. Bambito and cerro punta are a short ride up the mountain with hose back riding, hiking trains, and the famous quetzal bird watching trail. A hike to the highest point of panama, volcan baru is a highlight for hikers. Boquete is on the other side of the volcan baru where you can also find golf, rafting, tree trek adventures, etc. Louis is originally from North Carolina, USA, studied in the beautiful Appalachian Mountains in Boone, NC where I met my wife Yoribel who was born in Panama. After graduating college we both came to Panama, 24 years ago and have been living here where we had our two children, 17 & 14 years old. 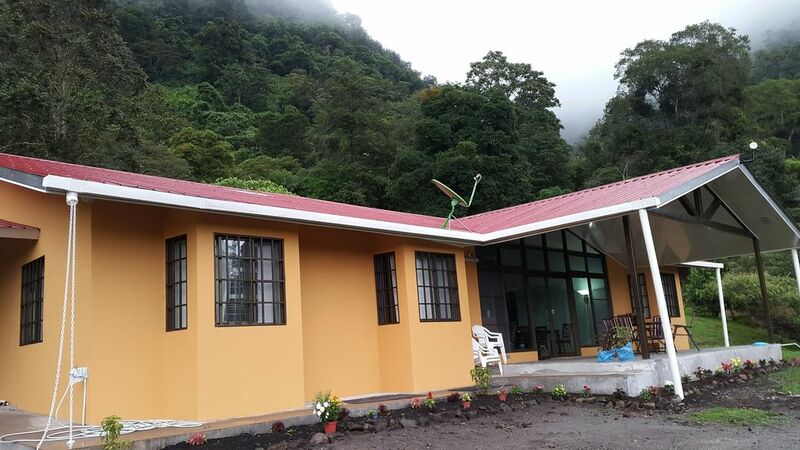 in 2014 we purchased this land in Volcan and set out to build a mountain home for our family, so we put a lot of care and love into this project and are happy to enjoy it during holidays and vacations and hope to use it to the fullest when retirement time arrives. In the meantime we thought it would be great to share what to us is a small piece of paradise and at the same time get some return on investment. We live in Panama City in the canal area currently and it is a perfect getaway to leave the busy city life to go to our mountain home. A fantastic house in a wonderful landscape. We had a great week of vacation there! This location is a very comfortable hideaway for nature lovers who likes to be off the beaten tracks. The house was equipped with all stuff to feel very well. Many thanks to the Kellar family for their friendly and helpful support. Highly recommended is to drive up to the little town of Guadalupe and to go hiking in the surroundings. And don't forget to eat strawberries with cream on your way back! A sanctuary in the hills. This house is the perfect oasis to retreat to at the end of the day and wake up to as you plan the next excursion. There are many day trips you can take from here—to the hip town of Boquette, the Jansen coffee plantation in Volcan, the orchid farm in Quadalupe, or hiking and rafting opportunities all around. Then come back to the Kellars’ homestead in the evening to barbeque and enjoy your front-porch perch, with views of the hillsides, the sweet sounds of the nearby brook and tiny waterfall, and the serenade of the crimson tanagers that swoop through the trees. We were there in March, when daytime temperatures were in the 90s but morning and evening temps fell to low 70s—great sleeping weather! One caveat: If you are renting a car, get an SUV. The road leading to the house is a bit rocky and a sedan or compact doesn’t have the clearance you need to navigate the terrain comfortably. Book this house—you won’t regret it and the Kellars are thoughtful and accommodating hosts! Four of us spent the month at this mountain home in Volcan. The house is very very comfortable and spacious. The kitchen was well stocked and had a lot of staples already in the pantry. The temperature was perfect T shirt day time and long sleeves at night. Wake to the sound of birds singing. Volcan is the perfect location for exploring the Chiriquí highland area. The town is not much to look at but the people are friendly and it has everything you need. A four wheel drive is recommended to be able to do everything there is to offer in the area. Thanks to the Kellar family, who have made their home available to us travelers! We loved our stay here. We were two couples and we were so comfortable. The weather in Volcan is great. No extreme weather here which is a reason we picked this area. We slept sound. The rooms are cozy and dark and quiet. The front glass wall is beautiful. We could enjoy the outdoors without going out and outdoors was just a step away. We love Chiriqui for the birding and this was the perfect place to go for that. Would definitely go back. We cooked alot in the kitchen and even baked some. Lovely home with lots of land and privacy all around. This is an excellent get-a-way house. We found the house very comfortable and furnished with all the necessities. The beds were new and The rooms were spacious. The kitchen has everything you might need to cook for a family. Although there was a TV we didn't watch it because we wanted to enjoy the front porch. There was excellent birding as soon as the sun came up. We were able to identify 70 species during the week. The Tanagers came by the dozens. The owners were very easy to deal with. They are bilingual and were very flexible with us. We really look forward to returning hopefully during the peak bird season of Dec-March. Coffee plantation tours, coffee tasting, great relaxation spot surrounded by multiple bird species and within 1 hour from tourists attractions.